Yesterday's news about the return of a marble lekythos to Greece from a Swiss-based dealer of antiquities made me go back through my notes. I see that in June 2007 a statue of Apollo was returned to Greece from Switzerland ("Greece reclaims stolen Apollo statue", AFP, June 14, 2007; see also "Greece hails return of stolen ancient statue", Reuters, June 14, 2007). The Apollo had been excavated by Federico Halbherr at Gortyn on Crete, and stolen from the site in 1991. 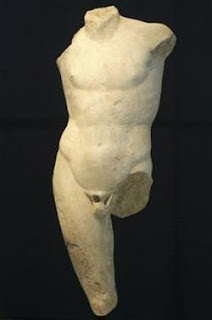 Greece on Thursday presented a Hellenistic-era torso of the ancient Greek god Apollo discovered in Switzerland more than 15 years after it was stolen from an excavation site on Crete. The headless torso was in the possession of art dealer David Cahn in Basel, and the Greek authorities intervened just before it was delivered to a private buyer, Culture Minister George Voulgarakis told a news conference. The 1st-century BCE statue of Apollo ... was stolen from the archaeological site of Gortyn in 1991 along with nine Roman-era items including vessel fragments and coins. In March, it was sold by a British art dealer to a German collector and imported into Switzerland for delivery by Cahn, who agreed to unconditionally hand it over to Greece, the ministry said. Who was the British "art dealer"? What about the "German collector"? And where are the other pieces that were stolen in 1991?